One of the modest people I know is Martin Romijn. 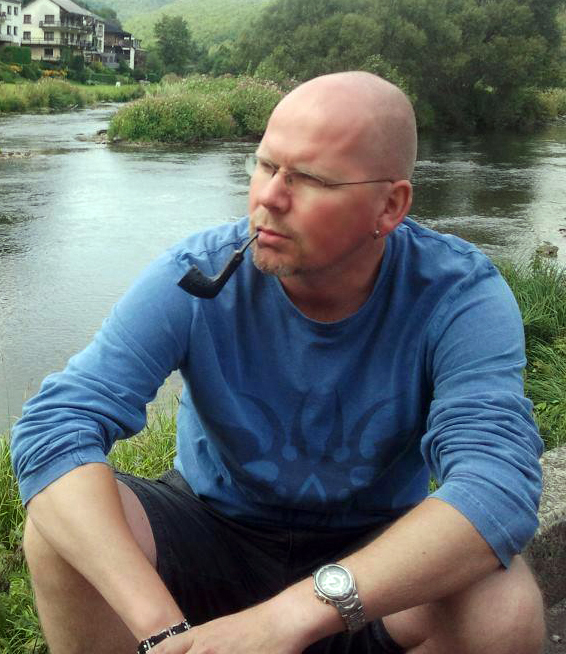 I got to know him through the Dutch/Belgian Smokers Forum and while browsing his profile there I noticed he had a website. I clicked on the link and saw what his site was about. The guy makes pipe-accessories out of stone? Wood ok, relatively easy to work with, but stone?? And more, the level of craftsmanship was astonishing! I could not believe my eyes when I looked at the exquisitely made tampers, pipe-stands and ashtrays. But Martin is very modest, “I just cut away the rest of the stone and then I end up with something beautiful”. Anyway, fortunately Martin was willing to do an interview with me. How long have you been a stonecutter and what do you precisely do in that profession? I have been a stonecutter for over 18 years. 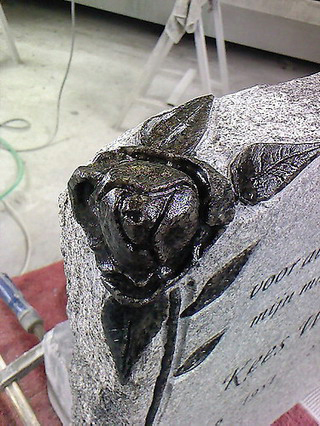 Besides grave-stones I also make products for buildings like door sills, window-sills, kitchen- and tabletops, bathrooms and fireplaces. Back in the days I learned the old handicraft. The old techniques with hammer and chisel, the real carving of ornaments etc. but also the carving of characters. Besides carving I also possess the skills for sculpting. What jobs did you have before you became a stonecutter and how did you come by this unusual profession? After school I joined the Dutch Marine Corps for 4 years, then I worked in the security business but I wanted to do something with my hands. So I started working in a motorcycle-store where I did the maintenance of the bikes. 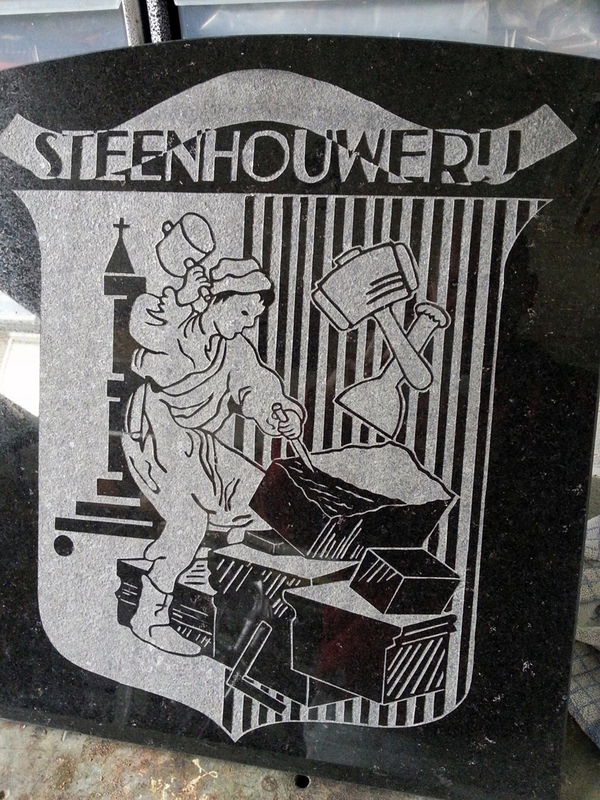 Sadly the store went bankrupt and after a while of being unemployed I did a retraining to the profession of stonecutter. It turned out it suited me well and besides the standard education (which I went through pretty fast) I specialised myself with the help of a teacher in the old handicraft. When and how the thought occurred to use your knowledge of the profession for the creation of ashtrays, tampers and pipe-stands? After a knee operation (ripped cruciate ligament) I sat home for almost over a year. 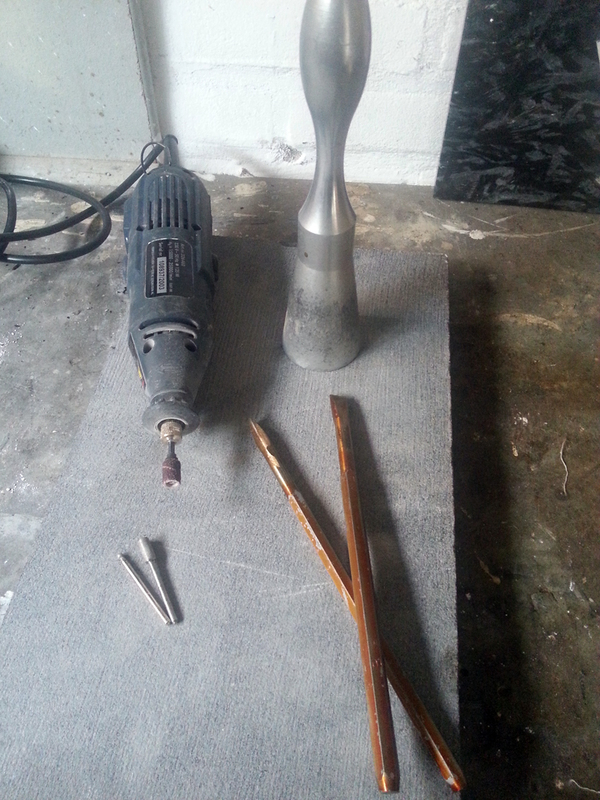 In that period I started making tampers. On the internet on several fora (then news groups like Alt.Smokers.Pipes (ASP)) I saw several tampers made from wood and synthetic materials. It occurred to me that I could make those out of stone. That is how the ball started rolling. I first showed my creations on a link on ASP, someone was so nice to host the pictures on his site. The feedback was so positive that I decided to go through with it. After that another acquaintance, who I knew through Smokersforums, created a website for me and I have been using that one since 2003. 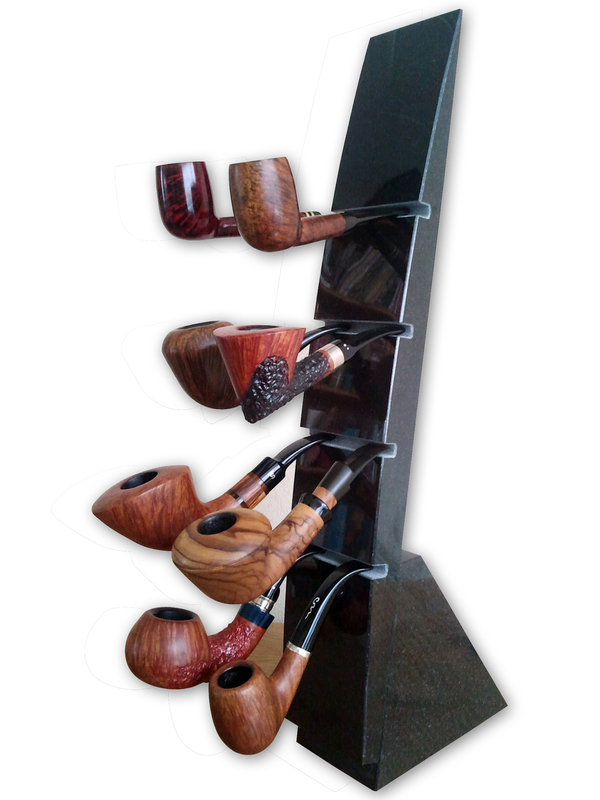 The pipe-stands came into existence later. 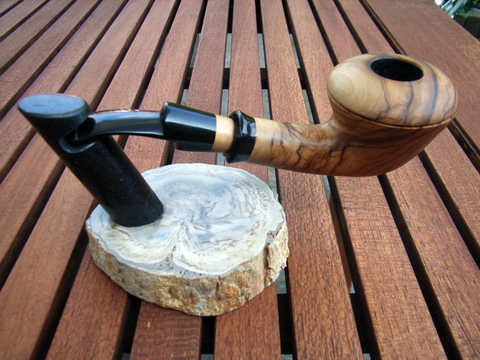 I got the idea to let the pipe “float” by making a pipe-stand which only held the mouthpiece. The ashtrays were a logical next step. How do you acquire your pieces of stone? The pieces of stone I collected at my job when something beautiful came along. When a nice piece is left over I set it apart. Some stones like beautiful pieces of petrified wood I buy at the wholesaler. The best is that when you are busy carving the stone you stumble upon a stunning fossil or crystal. Do you judge stone the same way a pipe-maker judges his briar? For example that you lay certain pieces aside from which you think to make a nice tamper. I select pieces of stone based on their structure. Pieces with a special pattern or present fossils I lay aside. When I look at certain stones I already see a shape or I get an idea. But most of the times the piece develops from out of the stone self when I am working on it. I let the stone inspire me, in fact I “unwrap” the piece I am working on. It is already hidden in the stone. Do you have one or several favourite species of stone to work with? Belgian hardstone and Jura are my favourite stone-species because of the present fossils and crystals. Also they are not so difficult to work with because they are not extremely hard. 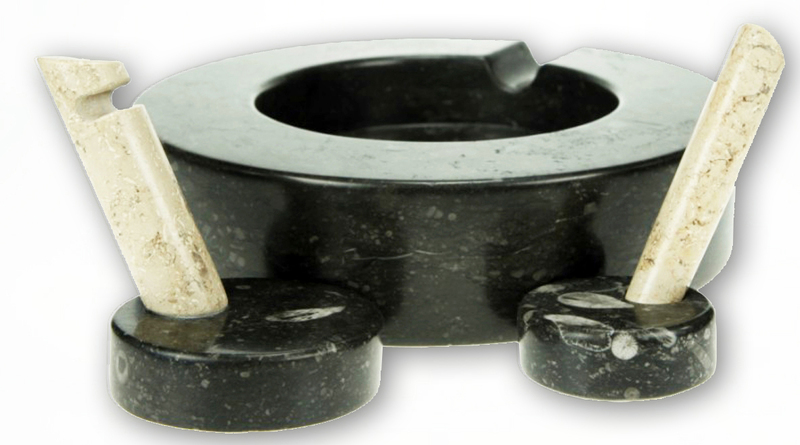 Do you let the stone decide what it is going to be or do you seek out a special piece if you for example want to make an ashtray? 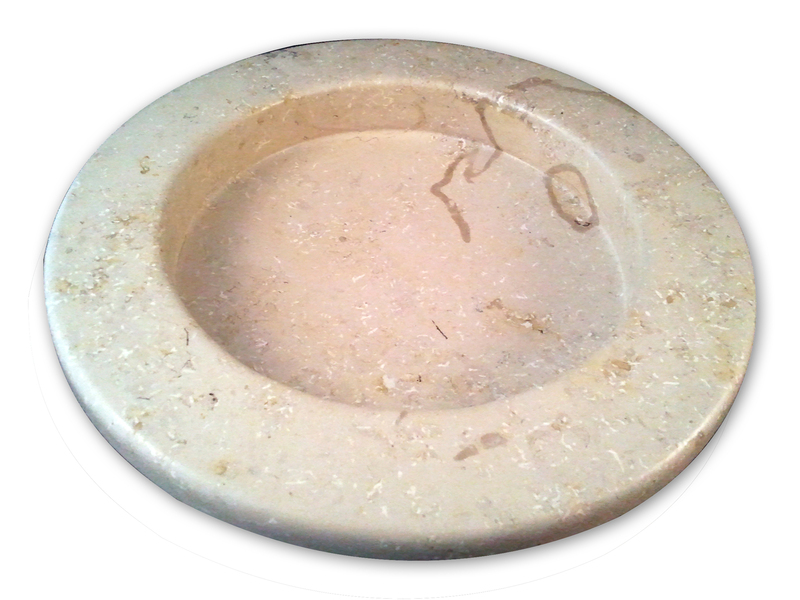 For an ashtray I seek out good looking pieces, preferably with a nice fossil. Like I said before, some pieces have a certain shape or texture which inspire me. But there are so many different species of stones, each with their own characteristics. Some better suited for carving than others. For example, the petrified wood is extremely hard to work with but then I got the idea to use it as a base for my pipe-stands. Ehrr.. Several chisels, a hammer, diamond sanding-pads, polish-tools and elbow-grease. Describe your method of working from a raw piece of stone to a finished product. I prefer to work without a plan, I let the stone inspire me. That does not apply for every creation. The rough work like sawing and cutting I do in the masonry. The finishing and polishing I do at home in my shed and takes up most of the time. You begin to polish away the crude scratches. Less deep scratches emerge which you then polish away with a finer polish-tool. etc, etc. The stage where you accomplish the final high gloss demands a lot of patience and perseverance. Sometimes I just have stop in between because my fingers are getting crooked from all the polishing. 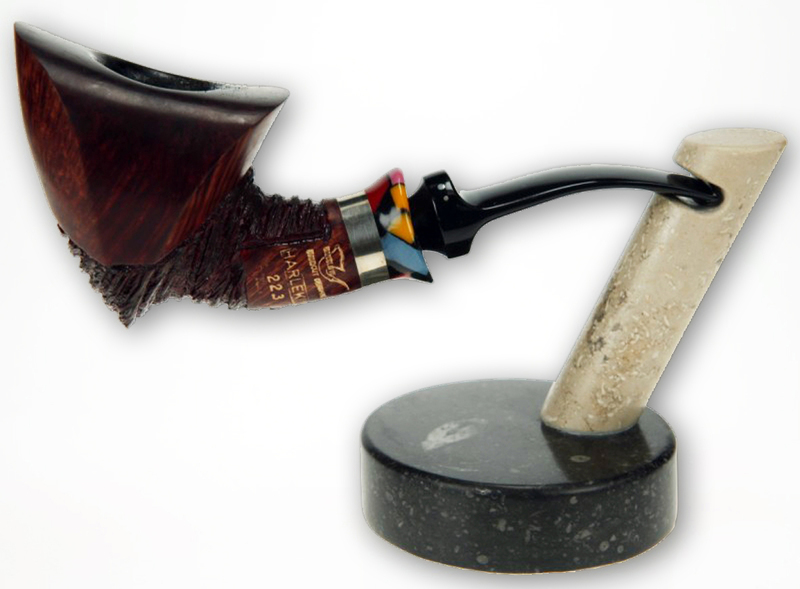 Usually the time to fill up a pipe… It also happens in this stage of finishing that you notice a flaw in the stone you have not seen before. A crack in the material you often see after a lot of polishing. If I don’t rust it I apply some brute force on the material. And yes, then it sometimes happens that after hours of labour you can toss your creation in the garbage bin..
On which creation you are most proud and why? Oww.. That is difficult.. 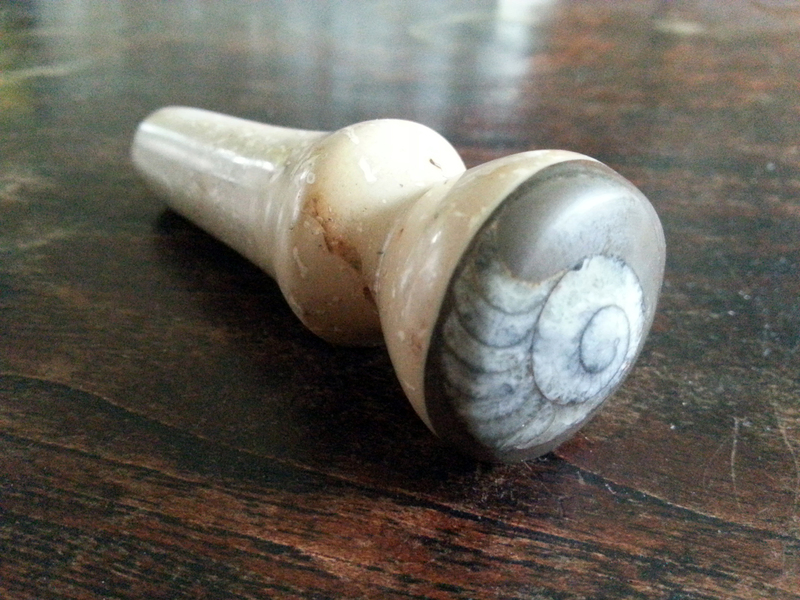 The tamper with an ammonite fossil Neil Archer Roan has is one of the prettier ones. I also like the dragonwing tampers. As far as pipe-stands go I think the one Paul has (see on the left) turned out pretty well. A special shape, great appearance. The Onyx 7 and 8 also turned out well, they just develop in your hands, nice to see. Well, I have made so many pieces I like in those 10 years, the choice is difficult. It is a nice thought that on various places far from here they found a home and somebody likes them. Can clients tell exactly what they want or do you always decide shape and material? Of course I work to satisfy the wishes of the client. But I shall always add my own contribution to the piece, I like to be surprised by the stone. Often clients give me a rough idea where I can work with. The future.. Well.. Making a living out of creating pieces from stone can’t be done. But I hope to spend more time on the making of my creations in the future. A bigger workshop in which I can make some statues would be nice. 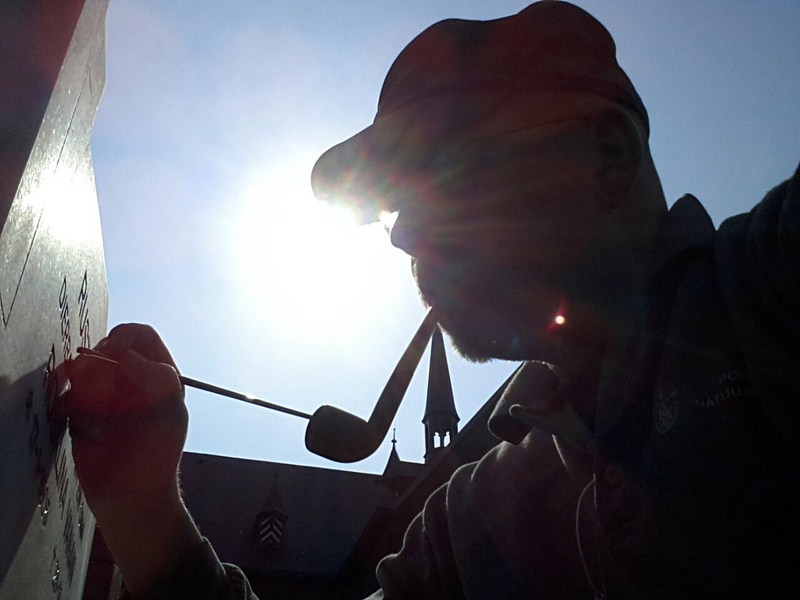 But for now, being busy in my shed, carving stone while enjoying a pipe, creating new things, I hope to do it for a long time. 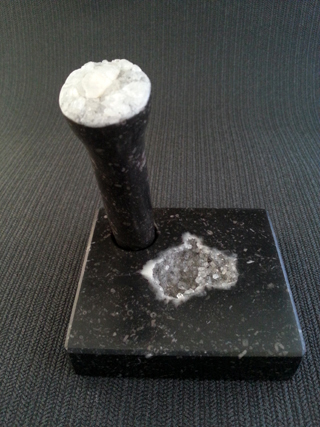 It is great that through my tampers I have contact with people from all over the world. That on a show in Las Vegas is being talked about my work in a presentation, that my work has been in a Russian Magazine, that sort of things is really fun to hear. It is great that people seem to appreciate a piece of handiwork. I also like it that I continue an old handicraft in a time where a lot is done by machines. I hope to create things that will stand the test of time, that will still exist when I am long gone. Very nice interview with a great guy who shows magnificent craftsmanship and creativity. I’m fortunate to have acquired some of Martin’s work and use his tampers, pipestand and ashtray with lots of fun and respect. Strangely, the very hard materials seem to feel soft and smooth in your hands, due to Martin’s hard work and finishing touch. 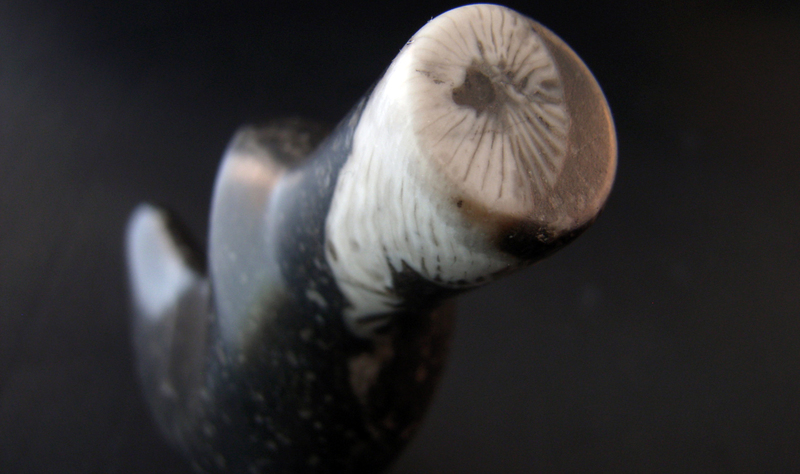 Also it makes you kind of humble, to use pipe smoker’s accessories which are up to 340.000 years old and even older. Martin, keep up the excellent work. Martin is a wonderful craftsman and a great person. I really appreciate the interview. Nicely done. Indeed he is mr. Roan. Thank you very much for reading. Thanks for this interview and also for showing these fine works of art by Martin Romijn. Daily I see and enjoy the craftsmanship of Martin. At home a petrified wood pipestand and some of his stone tampers. And for the car, on my request, he made for me a white marble copy of the (Decatur Industries) wooden car boy pipe holder from the seventies. Martin, your work continues to astound me. It is so beautiful. Arno thanks for the great interview with Martin. well done.